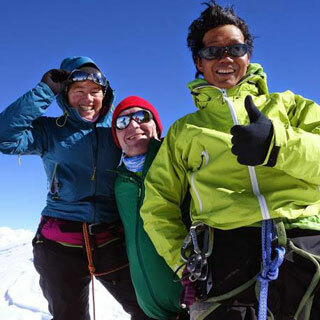 In April 2015 we had the opportunity to travel to Nepal again, this time on an expedition to climb Mera Peak with our guide Chandra Shor Rai. From the very first moment of meeting in Kathmandu, we knew that we would be in good hands with him. Chandra did review our equipment with great diligence and made sure that we were properly prepared in order to maximize our chances of a successful climb. His in depth knowledge of the mountain conditions was invaluable in getting us prepared. Also he communicated in very good English and very openly, making it easy for us to understand him and develop trust. Once we were on the trail it became clear that he also is very capable of organizing and motivating the team. With his friendly and open style he did ensure that the camp was always ready, briefed us properly on the path ahead and always looked after our and the porters well being. The food he prepared was always excellent and we never did experience any health issues on the way, due to his high standards of quality. Whenever possible he catered for fresh ingredients and did quickly respond to our specific needs. We never had better food on a trek in the Himalayas. Despite very challenging weather conditions on this trek, Chandra ensured that we, as well as the team, always were comfortable. He adjusted our daily route and routine to the actual conditions whenever required. This was done with a good eye for our capabilities, the weather conditions and the actual trail, and always with a smile on his face. Chandra was dedicated to give us an optimal preparation for the summit climb! As a guide he was always there when we needed him, while leaving us the freedom to walk as we liked whenever possible. His mountain skills are outstanding, both with respect to his personal climbing capabilities as well as leading a group. Every detail of the ascend was planned and executed to perfection. High camp was well prepared, summiting start timing adjusted to our climbing speed and all gear available at the right time. Under his guidance we always felt save, even in the unfavorable conditions we did face. Without him we would not have made it to the top, with him we made it safely and in great spirits. We can only recommend Chandra as a mountain guide wholeheartedly. His professional knowledge paired with his great attitude, good communication, dedication and friendliness do make him an outstanding leader.